La impunidad envuelta en un estandarte institucionalizado. Referencia cruzada: credits follow… | Cuernavaca no es Ayotzinapa, pero los vínculos entre la impunidad y el estado [por lo menos en México] parece que sí están allí… ingeniosamente inmiscuidos, ¿o a poco no?. 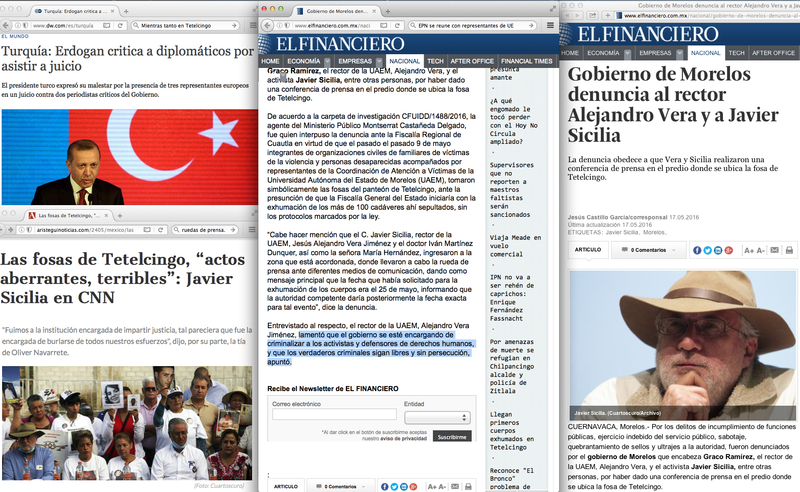 || Fair use of a “Mexican business-type” newspaper. …de arranque: la imagen de don Recep es cortesía de Deutshe Welle—©—Getty Images—©—La AFP—©— y O. Kose. This is to say, that when it comes to causation, the correlations of impunity and ‘those in power’ do seem to be there, crossing each other with consequences that seems to dictate political discourse —and agendas— around the world. “The wickedness,” as the poet with the Indiana Jones hat recently put it to CNN’s Carmen Aristegui, is that the governor [Graco Ramírez] chose March 28 of 2014 as the official day when the entire state of Morelos would pay homage to the victims of violence… a very loaded ‘public relations’ move on behalf of the political class. This is why they [the people] in Mexico say, that in politics, the only thing that is serious [there] is Lucha Libre. My Pillow’s time stamp: 11h Central Europe Time. 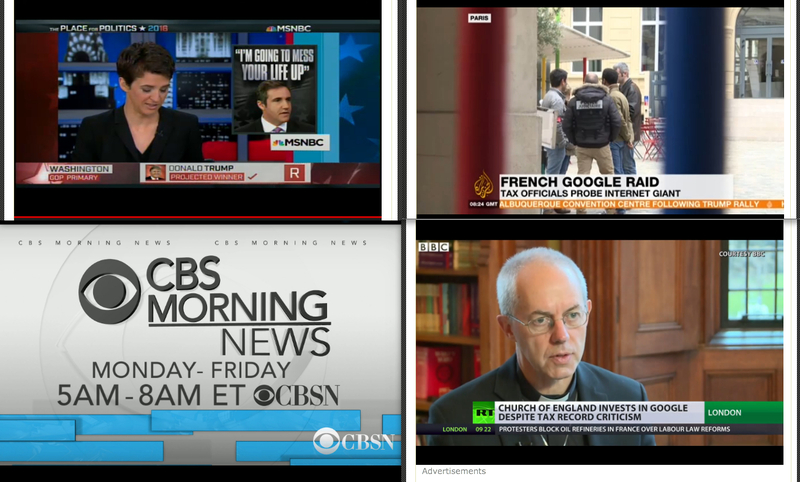 | La almohada del llamado sueño americano, y las noticias de Aljazeera. || Fair use of media —randomly— found on the interwebs… El comfort de tus nostalgias. It should be noted that on March 28 of 2011, Sicilia’s son —Francisco— was found [murdered] inside of a vehicle in town called Temixco [also in the state of Morelos]. At this point, it would probably be worth mentioning that on that day [March 28], six more victims were found inside of the same vehicle where Francisco Sicilia was recovered from. This is to say, that nostalgia wise: state, collusion, and criminality were all BUZZWORDS that oh-by-the-way, marked Mexican president Felipe Calderon’s six-year term in office—You know, the one that coincided with a federally sponsored “gun running” operation called Fast and Furious. “What’s up doc?”… Wrong turn in Al-boir-cur-kee… Media credits for the New Mexico riots follow, because that’s not all folks! The good thing about Mexican current affairs [International “patatas bravas” Edition] is that the ruling political party’s good name has been saved. 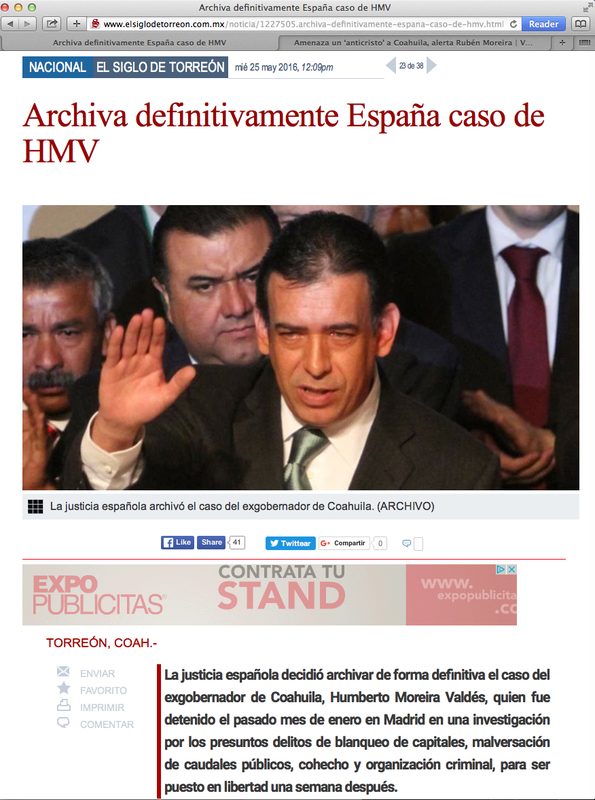 In Spain, the virtue and the FAMILY NAME of the former governor of the state of Coahuila [Humberto Moreira] is now a case for the archives. Case closed for the man who, at one point in his political career, also hopped his way to the chairmanship of the ruling party. Maybe, just maybe, that’s why this case displays the same characteristics of a teflon® ‘don’ trial in —say— New Jersey. I typed the latter because the charges against Moreira [como de costumbre] did not stick; those charges, by—the—güey, ranged from the embezzlement and misappropriation of state funds, money laundering, bribery, and criminal associations with the same criminals [mind you] that Eric Holder [ a former team U.S.A. Attorney General ] authorized the selling of automatic weapons to. Sin comentarios… excepto lo del Uso Justo de los Medios para poder actualizar “Lo Único Que Es Serio de la política en México—es La Lucha Libre”. In a case that holds its weight on judicial dissonance [nada que ver con la disonancia cognitiva] the arrest of Moreira, which happened earlier in mid-January, followed a detention request from the U.S. government. 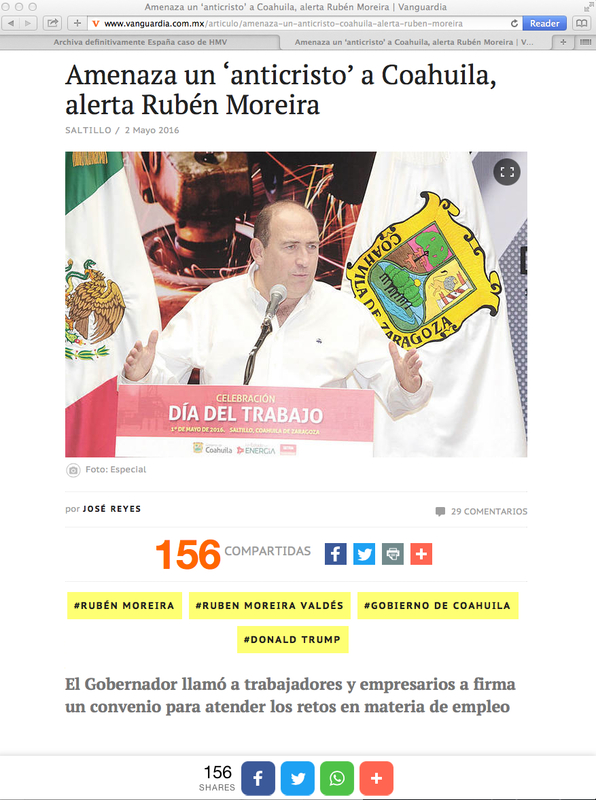 In Saltillo* [the state capital] the agenda is now set to move on to a more clear and present danger, or as the Rubén Moreira, eldest brother of Humberto —and current governor in that same state— would say: the penny dreadful threat of Donald Trump becoming president of Team U.S.A… Donald is Coahuila’s Antichrist, this according to the current Moreira in power, in the state of Coahuila de Zaragoza. * Saltillo [en Castellano] roughly translates to Little hop/skip. El comal le dijo a lo olla: #MissiónCumplida… y “el chapo” se va a las ligas mayores en los EE.UU. | Uso justo de los medios para mejor ilustrar lo que son las notas cruzadas… Salud, y Patatas Bravas para todos!!! ** Team U.S.A. bureau of Alcohol Tobacco and Firearms. Publicado el 25/05/2016 por Armando Segovia. Esta entrada fue publicada en Ayotzinapa para espontáneos y etiquetada Ayotzinapa, Coahuila de Zaragoza, Cuernavaca, El "estado" de Cuernavaca, Eric Holder and the ATF vs. The Sinaloa cartel, Humberto Moreira, Javier Sicilia, Morelos es el estado de Platanito, My Pillow, Policia Nacional de España, Temixco, Tetelcingo, The exception to the rule: correlation and causation. Guarda el enlace permanente.